In my last few posts I’ve been sharing gorgeous designs and cute romper patterns for babies and toddlers. 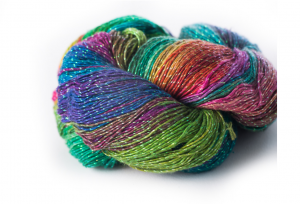 Today I hope to inspire you in a totally different way, by presenting you a profoundly good, human yarn and fibers importer, wholesaler and retailer : Darn Good Yarn. Like many bloggers, I occasionally use affiliate links (which means I get some money if you follow one of my links and end up buying something). Well yesterday, I stumbled onto Darn Good Yarn’s affiliates program. I had never heard of this shop. But guys, everything I’ve learned about them so far absolutely WOWED me. Darn Good Yarn repurposes manufactured waste from Nepal and India, turning them into breathtaking yarns and finished products. The results? 500 000 less pounds of waste fabric in landfills over the last 8 years + employment opportunities for 300 Indian and Nepalese women. Not bad, eh? But wait: there’s more! Closer to home, they also take care of their community by employing people with developmental disability. No wonder the US Chamber of Commerce gave them the Community Excellence Award last year! 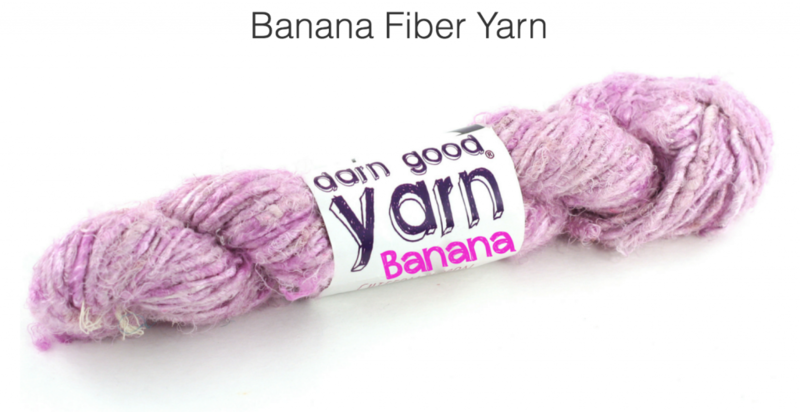 The banana fiber yarn (yes, banana) is a surprisingly soft yarn that’s biodegradable, vegan and eco-friendly. 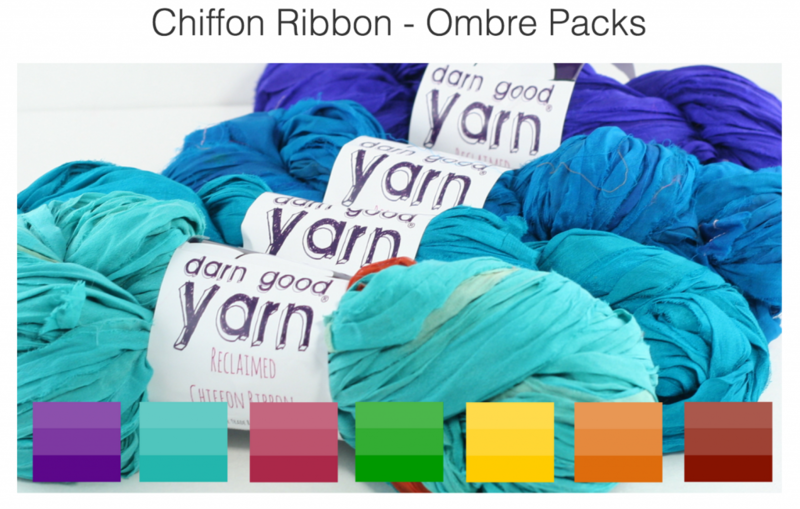 You can also find various chiffon ribbon packs (ombre, solids, patterns, polkadot, etc.) made from reclaimed saris and other lightweight items. 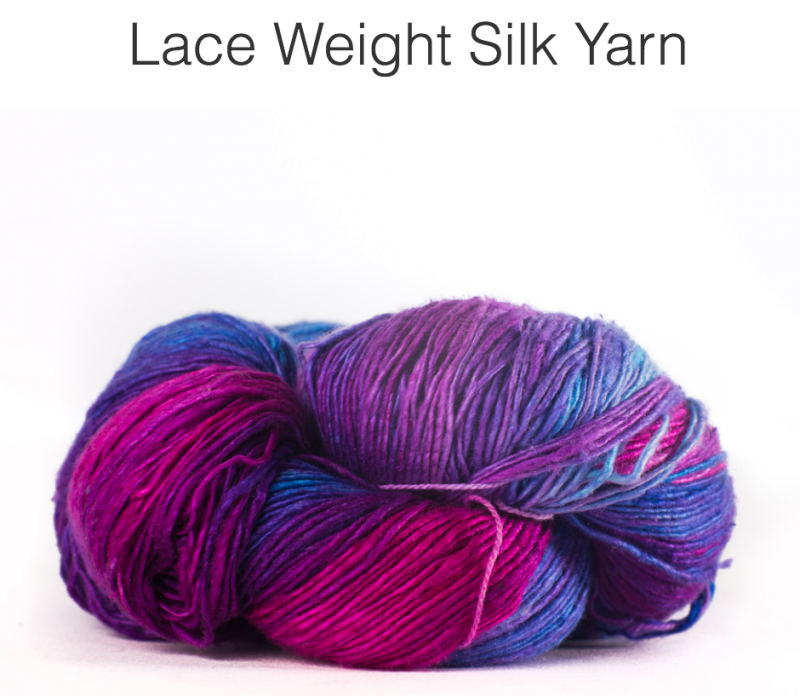 This gorgeous lace weight silk yarn comes in lots of fantastic hues, some sparkly. It’s made from Indian reclaimed silk, fairly traded. I’ll actually be reviewing it soon – yay! making Indian and Nepalese women more self-reliant. Plus, you get really cool yarns and artisan goods! P.S. – I will keep you posted when I receive my lace weight recycled silk yarn. In the meantime, if you do try their yarns (or if you already did), I would love to hear about your experience!